The RLE FLHB is available in T8, T5, T5 HO, in 3, 4, 6 or 8 lamp configuration. Also available in 10 lamp T8 or T5HO. Ideal for factories and warehouses where high levels of illumination are required. 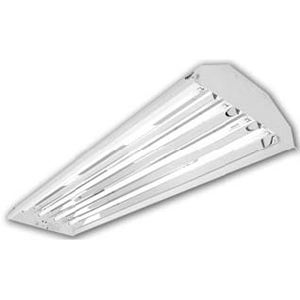 Enhanced aluminum reflector maximizes light output while offering high efficiency. Pendant mounting (for chain or cable) standard. Optional quick connect hook with 24” cord and NEMA twist plug for chain hanging. Unit comes standard with open bottom. Available with framed wire guard and/or clear or prismatic lens for areas that require lamp protection. Optional mono-point hub/splice box for simplified HID replacements. 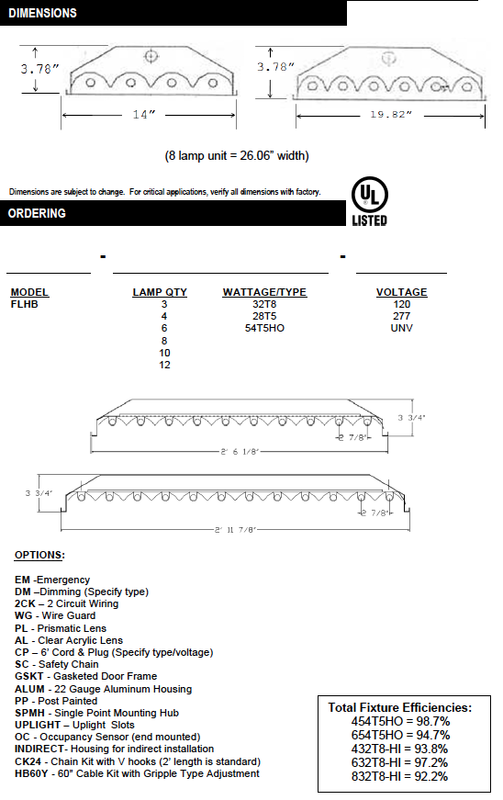 Optional provisions for dimming/HI-LO controllable systems for additional energy savings. Die formed heavy gauge steel with knockouts for stems or chain hangers. All metal parts are pre-painted with high-gloss, baked white enamel with minimum 89% reflectance applied over iron phosphate pretreatment for maximum adhesion and rust resistance. Post-painted units finished in gloss white powder coat.